Mounting a flat-panel display to your wall is not a difficult task. Most Weekend Warriors can accomplish it with the correct tools, basic handyman skills, and a little planning. 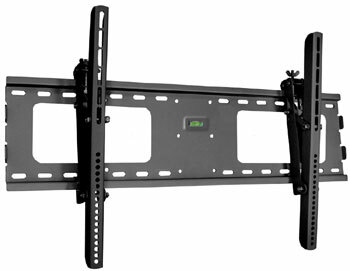 Wall mounting is an excellent way to take advantage of the flat screen design to eliminate clutter, obtrusive furniture and hide the cables. The most challenging flat-panel to mount on your wall is a plasma display. A typical 50-inch plasma display can weigh almost 80 pounds. LCDs or LED displays are nearly half the weight. The greater the weight the greater the challenge, so pay close attention to proper installation procedures to make sure it is mounted securely and stays up on the wall. Note: depending upon the weight of the display you may also need a second pair of hands during installation to help with the lifting and positioning of a heavy unit. While there are various types of mounts on the market: Tilting, Articulating, Swiveling, Low profile (view specific mount options here); deciding between them depends on where you plan on locating your display. The most common installation, such as a bedroom wall, uses a standard low-profile tilting mount, which is one of the easiest to install. Low-profile mounts require less than 2 inch spacing between the wall and the display back and are the best option for concealing cables and connections. The least common installation, with the highest degree of difficulty, is above the fireplace. Extra care is required to avoid damaging the flue and causing a hazardous condition. Hiding the cables is more difficult and normally requires wire channel or surface mounted raceway. In many cases the display will be located too high for best viewing. The best height is at eye level for the center of the screen, when sitting in a chair or sofa. This will eliminate looking up at sharp angles, which can be very uncomfortable. A tilt mount in this application is an absolute necessity. No matter the location the basic installation principles are the same. Rest assured that all mounting kits from Ram Electronics come complete with detailed instructions. This is a short list of the tools needed. Most will already be in your tool kit from previous projects. 1. Attach the display mount half to the rear of the display by following the directions included with the wall mount kit. The display should be standing up to avoid damaging the screen and prevent damage to the internal electronics. The newer displays have standard mounting holes per VESA specifications. 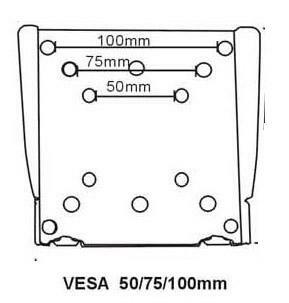 VESA is a standard pattern of mounting location holes on the back of a Plasma or LCD TV which allows many standard Wall Brackets and Wall Mounts to be easily fitted to your Plasma or LCD TV. Almost all of the major Plasma and LCD TV manufacturers make Plasma and LCD TV's which are VESA compatible. Here are the typical VESA standards for small displays. Larger displays will have increased spacing. Make sure the hardware in the kit is complete and fits the mounting holes. Attach the display portion of the mount. The screws should be snug but not overly tightened. 2. Decide the location for the display that allows optimal viewing. The middle of the display is best viewed at eye level to avoid angles, unless you can mount it far enough away to avoid looking up at a sharp angle. Like mounting over a fireplace, tilt mounts are best if you must mount the display higher. 3. Attach the wall-mounted portion to the wall. Use a stud finder to locate the center of each stud. Most studs are on 16 inch centerline and 1-1/2 inch wide. After you locate the center, drill a pilot hole in the center of the stud using an electric drill. Most mounts come with lag bolts for attaching the wall half on the wall. Shown below, is a rule-of-thumb chart for proper pilot hole drill sizes. Do not use soap on the lag bolts as it can cause premature rusting. Make sure you level the hole locations using the mount as a template for drilling: "Measure twice, cut/drill once." Also, make sure no power cables are located in the area of the drilling. Some of the new stud finders have a power cable-locating feature that is very handy. Here is a tip: if you don't have a stud finder or you want to confirm the stud's center, drive a small finishing nail into the drywall every 1/8 inch to 1/4 inch until you miss the stud on both sides, mark the center. The holes are easy to repair with a little drywall spackle and a putty knife. This will now give you a good reference point for confirming the adjacent stud center line. Check that your mount is level again and drill your pilot holes. Use the socket wrench to tighten the lag bolts and mount to the wall. 4. Now you are ready to mount the display to the wall bracket. This is when you will need a second pair of hands, since some of the displays weigh as much as 80 to 90 pounds; they can be difficult for one person to manage. After hanging the display adjust the location and tilt on the mount for proper viewing angle. Lock and secure the display mount to the wall as instructed to prevent the mount from separating, as a safety measure. You are now ready to enjoy your finished project and the satisfaction of knowing you saved some money. In Part 2 we show you how to hide the cables in the wall using a Powerbridge wall plate. To purchase a wall mount for your home, visit the wall mounts section of our store, or call us Toll Free at 888-726-2440.